Isabel Arends is head of the TU Delft Department of Biotechnology and professor of Biocatalysis and Organic Chemistry in this department. Her research focuses on the development of catalysts for green products and medicines, with an emphasis on the development and application of enzymes. She studies oxidative enzymes and metal hybrid proteins, and explores their potential for sustainable production of epoxides, alcohols and ketones. 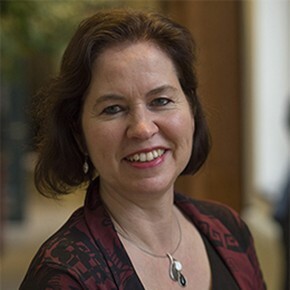 In addition, she is vice-president of the Post-Graduate School (Biotechnological Sciences Delft Leiden) and a member of the board of Technology Foundation STW. She teaches the courses “Green Chemistry and Sustainable technology” and “Biocatalysis” on the BSc- and MSc-level and teaches the advanced course “Biocatalysis” for industry and PhD students. Enzymes as catalysts for biotransformations. Selective oxidations, using biomimetic and enzymatic catalytic systems. Cherando Pereira, PA, Arends, IWCE & Sheldon, RA (2014). A green andexpedient synthesis of enantiopure diketopiperazines via enzymatic resolution of unnatural amino acids. Tetrahedron Letters, 55, 4991-4993. Cherando Pereira, PA, Arends, IWCE & Sheldon, RA (2014). Robust and straightforward chemo-enzymatic enantiopure dipeptide syntheses and diketopiperazines thereof. Tetrahedron: Asymmetry, 25, 825-832. Churakova, E, Tomaszewski, B, Buehler, K, Schmid, A, Arends, IWCE & Hollmann, F (2014). Hydrophobic formic acid esters for cofactor regeneration in aqueous/organic two-liquid phase systems. Topics in Catalysis, 57, 385-391. Hiseni, A, Medici, R, Arends, IWCE & Otten, LG (2014). Enzymatic hydration activity assessed by selective spectrophotometric detection of alcohols: a novel screening assay using oleate hydratase as a model enzyme. Biotechnology Journal, 9, 814-821. Holtmann, D, Fraaije, MW, Arends, IWCE, Opperman, DJ & Hollmann, F (2014). The taming of oxygen: biocatalytic oxyfunctionalisations. Chemical Communications, 50, 13180-13200.